Today Kerridge wharf looks like a modern industrial shed surrounded by a piece of unused land. 150 years ago it was a hive of activity receiving newly quarried stone from Kerridge quarries, brought down along the Rally Road (tramway), sawing this stone into useable pieces, and dispatching them by canal boat to all corners of the kingdom. Such activity required facilities and these amounted to a main shed within which the sawing took place, and a range of smaller buildings housing, we know, a smithy and carpenter’s workshop (top right of the 1912 picture). What is today a dry dock was then used as a loading dock which could hold two narrow boats side by side. Also on the site in later years was a trio of kilns – shown on the 1909 OS map as an old limekiln – and another building positioned away from the others and the tramway. The purpose of this is not known. This interesting site has now been brought to life by retired craft skills teacher, Keith Scammell. 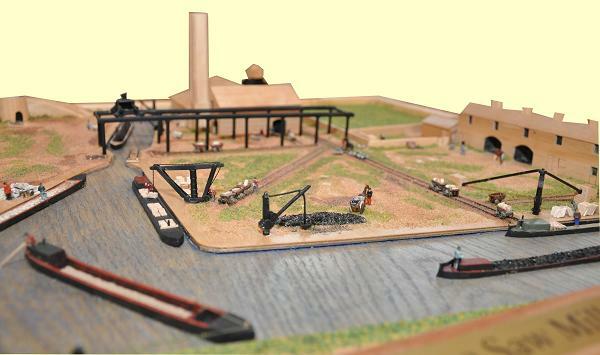 Keith has built a scale model (several pictures below) of the whole site as it seems to have been in the 1870s, providing a fascinating insight into this little hive of industry on the canalside. The rest of this page is taken from Keith’s description of his project reproduced with his very kind permission. 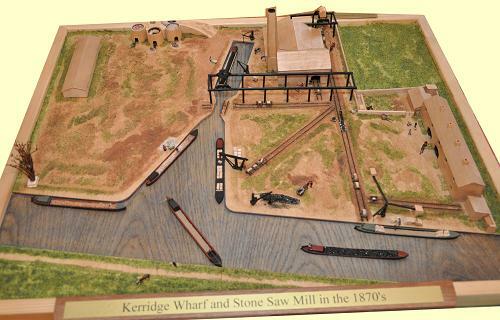 The idea of making a model of Kerridge Saw mill started a number of years ago when John Jackson, owner of the dry dock, showed me photographs of the 1912 breach of the Macclesfield Canal which occurred almost opposite the dock. These show in the distance the mill with its chimney, the row of cottages and a crane. 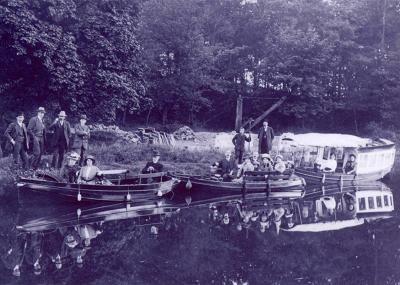 Malcolm Bower, secretary of the Macclesfield Canal Society , found large scale Ordnance Survey maps of the area dating back to the 1870s and these have provided most of the information for the model. John’s recollections from when he was reclaiming the wharf to convert it into the dry dock have been invaluable. Sadly in 1942 the US air force bulldozed what remained of the buildings and took the stone away to build runways at Burtonwood (where M&S and IKEA are today at Warrington). There is today nothing left of the mill or cottages but luckily the wharf was not destroyed. This has taken on a new life as the dry dock. The line of the old tramway [Rally Road] from the wharf up to the steep incline under Windmill Lane can still be seen today. The track (rails) has long since gone but we unearthed two six foot lengths of wrought iron double fish belly track still wedged to their chairs and pinned to stone slabs. These showed it to have been forty two inches gauge, 3ft 6in. We don’t know how junctions were made between the main tramway and radiating lines. Were there small turntables or just a hard flat area that enabled individual wagons to be shoved round onto the desired track? None of the maps show any track on the north side of the dock. However, when John Jackson was clearing the dock area around the narrow entrance he removed a number of very large stones from each side. One on the north side had holes that could have pinned rail chairs while on the south side he unearthed a thirty inch diameter cast iron base ring for a turntable. This is now held in stone setts a few feet from where it was found. We have found no evidence of track going anywhere north of the dock though Dennis Suleman in his book On the Level had a line going up to the Beehive mill, just a few hundred metres along the canal at bridge 28. In this view the saw mill is in the foreground with the tramway coming in from Kerridge Hill quarries at the bottom. From the 1874 OS map the outline of the building and feint lines suggest a T shape plan with an extension on the south side. I have interpreted this as a lean-to. The 1891 map implies an addition on the north side. Ground space between building and dock edge has been halved. I have drawn the conclusion that some time after 1874 improvements were made to the mill including installation of steam power and extension of the western travelling crane. Unfortunately the 1909 map seems to go back almost to the 1874 plan but adds a small rectangular structure on the north western corner. If this is the chimney its position does not seem to match the photographs. In 1909 the mill is described as disused. I have therefore placed more credence on the photograph and put the chimney on the north east side of the gable end. The photographs were taken from a considerable distance and although of high quality I am unable for certain to see the entrances. I have therefore assumed where they might have been. Likewise I have no evidence of the track going in the mill. The 1912 photographs give a clear view of the north elevation of the cottages. They are clearly unoccupied; a factor born out by the lack of any entry in the 1911 National Census. There had been families living at the Wharf Cottages in all previous National Census including 1901. John’s information was that the two wagon doors housed the blacksmith’s and carpenter’s workshops. The single story building east of these might have been stables. A trough is marked on the 1891 map. Is this a horse trough or the main drinking water supply? Two types of crane can be seen on both maps and photographs. The 1874 map shows a pair of parallel lines at each end of the saw mill. The 1894 map labels them ‘travelling cranes’ and shows the western one extending across the entrance to the dock, presumably to allow loading straight into boats. The 1912 photograph confirms these to be overhead travelling cranes. When enlarged to its maximum the eastern crane appears to have both north/south travel and some east/west travel. The blurred structure on top is probably a windlass operated drum winch. This was common. As many as four men would climb up to the gantry to operate large windlasses on each side of the drum winch. Men below would drag the crane along by means of ropes or chains. The western crane is largely demolished but at least fourteen vertical posts can be seen in the picture. The 1874 map labels three small circles with a C and there are three more small circles unlabelled which could also be cranes. The 1912 photograph of the cottages has a back braced crane near the edge of the wharf in front of the cottages (to the right in the picture above). There is still today one remaining crane base. It is a five foot high tapering cast iron pillar embedded in a solid stone foundation. The pillar is ten feet from the wharf edge so to load a boat the crane’s jib would need to be at least fourteen feet long, a large crane. I have installed a cantilever crane here (to the left in the picture above). The other cranes were probably smaller so I have based these on cranes similar to the one in the photograph of Styperson Wharf (right). The 1874 map does not show one; 1891 marks a brick kiln; 1909 says it is an old lime kiln. John Jackson in clearing this area in the 1970s unearthed the circular bases of three kilns. Interestingly he also found they had underground flues radiating out from them. I have interpreted these as lime kilns but I understand that it was not unusual for lime kilns to be used for firing bricks. 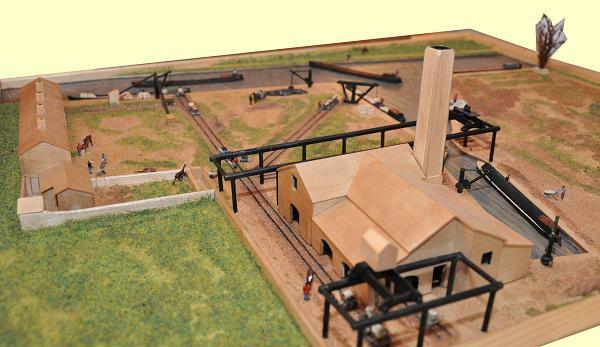 A kiln can be seen on the model, top left in the picture above. The purpose of the crane at the top end of the dock (couldn’t load anything into a boat from that position). The scale of my model is 1:150. This was arrived at as a compromise between showing the maximum detail and not having a too ungainly board to handle. Where I have had hard evidence I have complied with it otherwise I have tried to imagine how things would have worked. For instance, ‘raw stone’ coming down the tramway would be in trucks with sides (because of the steep gradient at the top of the incline, see Rally Road). It would be lifted off by the first travelling crane, transferred to a flat bed truck and taken into the mill for sawing and dressing. It would be lifted off at the west end and either put straight into a boat or put on the diagonal track and stacked on the outer wharf for later shipment. Much stone dressing would be done in the open air because of the dust created and the need for good light. I have assumed that a lot of the dressing would take place in the south facing lean to. This I have made with large open doorways. It is interesting to note that the cill (the stone below the foot of the lock gate) at the entrance to the present day dry dock will only just allow boats with two foot six inches of draught to cross it. This was only raised six inches from the original when the present gate was installed. Boats needing a greater draught than this would have been loaded on the outer wharfs. Two sheets of birch ply form the base (at canal water level) and wharfs. The buildings are any wood I had available faced with maple and roofed with one sixteenth model ply. The track is one millimetre welding wire soldered on to brass pins every inch or so. The boats are carved out of wood and of various heights to simulate the depth of loading of each one. The cranes and small items like trucks and wheel barrows are made of brass and silver soldered together. The people and animals are N gauge models which are approximately the right scale. 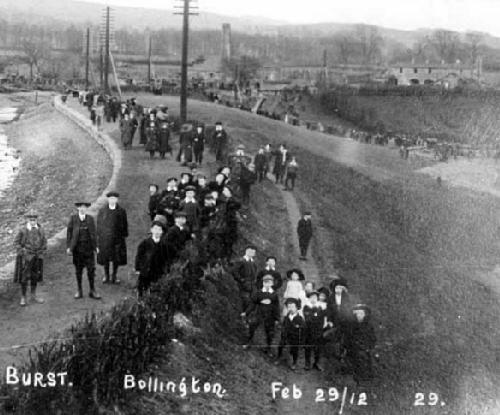 More on the Macclesfield Canal, and the ‘Bollington Burst’. I am most especially grateful to Keith Scammell who undertook the research, made the very fine model, and wrote it up for this page.